The German battlecruiser Gneisenau has just successfully – and most improbably – run the gauntlet of the English Channel. Now, her luck has to hold as she steams toward Holland with the Allies in pursuit. And luck is a commodity in short supply . . . The Secret of the Gneisenau is an adventure for GURPS WWII: Weird War II, where the fantastic is mixed with the historical for the ultimate in roleplaying. 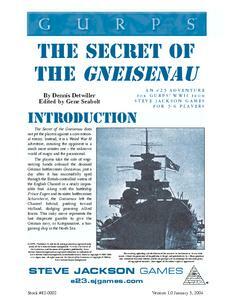 Can you save the Gneisenau before her luck runs out? Can you save yourselves? GURPS WWII: Weird War II – Everyone's heard the stories of World War II – now take a look at the stories your teachers couldn't tell you in high school.